Don Porter has spent most of his adult life diligently promoting softball around the world and was instrumental in the movement to provide the sport’s players the opportunity to play on the world’s biggest stage as part of the Olympic program. 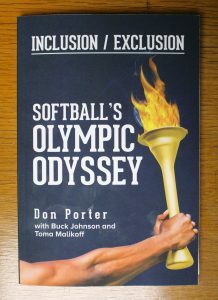 Porter now is sharing stories from his 30 year quest to internationalize the sport in a new book, “Inclusion/Exclusion: Softball’s Olympic Odyssey.” Released by Yorkshire Publishing, the book is available for purchase on Amazon.com and BarnesandNoble.com. Porter, who has served on the United States Sports Academy’s National Faculty and is a member of its Board of Visitors, details his time in key leadership positions of the International Softball Federation (ISF), having served as secretary general from 1965 until 1987 and president from 1987 to 2013. Under his leadership, softball was first elected to be part of the Olympic program for the Atlanta 1996 Olympics. 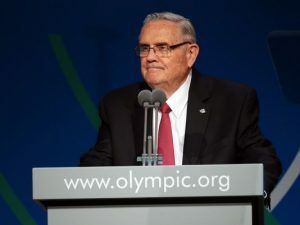 After the sport’s removal from the Olympic program following the Beijing 2008 Olympics, Porter helped set up the World Baseball Softball Confederation (WBSC), which set as a goal the inclusion of both sports in the Olympic program. Softball will be reintroduced to the Olympic program for the 2020 Summer Olympics in Tokyo. “The book is about my involvement with softball, about its history of moving in and out and back into the Olympic program,” Porter said. “It starts in the beginning, back when it was difficult to try and internationalize a sport that was mostly played at the rec level in many places. Today the sport is popular globally and is played all over the world. The WBSC was founded in 2013 and merged the ISF with the International Baseball Federation. Headquartered in Lausanne, Switzerland, the WBSC has 208 National Federation members in 141 countries with millions of athletes worldwide. The WBSC and its current president, Ricardo Fraccari, oversee all international baseball and softball competitions. Porter was the WSBC’s co-president from 2013-14. Porter – a former collegiate and semi-pro football player – said softball’s rules are simple and the game can be played by anyone. “I love softball because it is simple to play and to understand,” Porter said. “It is easy to adapt to, it can be played in most climates and in small or large spaces. Softball is fun to play, too, and there is a certain amount of skill involved. Porter, an Oklahoma City resident, hopes he will be able to attend the softball competition in person in Tokyo in 2020. Porter also served four seasons as an official with the National Football League from 1976 to 1979. Porter also served the United States Olympic Committee (USOC) as chairman and member of a number of committees including the Board of Directors from 1984 until 1998 and spent time on the USOC’s International Relations Committee. He is also credited as being one of the founders of the World Games. Porter was recently honored for his 55 years of service to the sport at the Amateur Softball Association/USA Softball 85th annual meeting in Shreveport, La. In his service to the advancement of sport, Porter has also been a leader in the “Sporting Goods to Go” project, which has provided sporting equipment to those who don’t have it, especially in countries in the Middle East and Africa. The effort has provided more than $30 million in equipment to more than 70 countries. The program is overseen by SportAccord, the umbrella organization for all (Olympic and non-Olympic) international sports federations as well as organizers of multi-sports games and sport-related international associations.